Why Don't Humans Have as Much Hair as Other Primates? 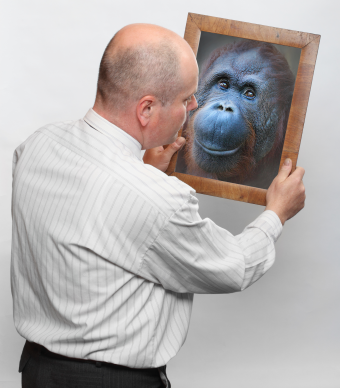 K. Crain asks: Why aren’t humans furry like other primates? Although there is no definitive account of why we lost our body hair when every other primate is covered with the stuff, there are a handful of compelling theories that may explain our hairless condition. One early explanation for why we, alone, are the only relatively “naked” apes was the aquatic ape hypothesis. First floated (pun intended) by a pathologist, Max Westenhöfer, in 1942, the idea became popular in the 1960s after it was adopted by marine biologist Alister Hardy, writer Elaine Morgan and zoologist Desmond Morris. Essentially, the aquatic ape theory holds that during a brief period in our evolution our predecessors enjoyed a semi-aquatic existence (i.e., they lived near water and spent a great deal of time swimming, wading and diving for food). In support of the theory, they claim that we shed our hair (which would only be a drag in the water) and added, like other marine mammals, a layer of body fat. Compelling in its simplicity, the theory has been largely discredited, mostly because there is no evidence (such as in fossil record) to support it. However, the study of human and lice genetics has produced evidence that, for whatever reason, our ancestor Homo erectus lost its hair while living in the African savanna about one million years ago. Given the location and climate, this has led some evolutionary biologists to opine that while “running around and sweating” in that hot climate, Homo erectus shed its heavy body hair in order to promote cooling by facilitating perspiration. This theory has some holes, though, including that many species of monkeys that live in savannas today are very hairy, as well as the fact that, while less hair during the day would help keep a body cool, at night, it would be much more difficult to stay warm. Also detracting from this hypothesis is the fact that our nearest relative, the chimpanzee, also has less hair than it should for its size (including very little on its head), but rather than living on the hot savanna, it resides in cooler jungles. A third popular theory is that we shed our thick hair making our bodies a less attractive home to creepy crawlers who like to feast on our blood (think lice, ticks and fleas) and spread disease. Beyond disease prevention, which is seemingly a great natural selection tool, over time, bare skin would also signal to potential partners that we have fewer parasites, which makes us more likely to be healthy, and therefore a better mate. Under this theory, bare skin was selected until it became the norm. Another interesting hypothesis has to do with our relatively long childhood, in which we retain certain juvenile traits well past the age when other apes would have matured; under this theory, it’s thought that we simply never lose the juvenile hairlessness trait. Notably, the second-least hairy ape, the chimpanzee, like us matures slowly with females not reaching reproductive age until around age 13. A fifth theory that is receiving more attention lately proposes that we lost our hair facilitating better communication – signaling by facets of our skin and expressions on our faces. As anthropologist Barbara King described it, “we humans possess a whole skin canvas.” Unlike many mammals, which can only see a limited range of colors such as blue, yellow and sometimes green, humans can see a much wider array; this is because humans have an extra cone in our retinas (trichromatic as compared to dichromatic) that allow us to also perceive colors in the red-green zone. Altogether, our third cone allows us to distinguish the pink of a blush, the yellow of jaundice and the purple of a bruise, all of which provide an evolutionary advantage. Interestingly, other Old World primates also have trichromatic color vision, and, although not to the same extent, less hair, particularly on their faces, when compared with mammals and New World primates who are monochromatic or dichromatic. Although we’ve lost our thick coat, we still have as many hairs on our bodies as one would expect to find on any ape of similar size, it’s just that today’s human body hair (at least for most of us) is remarkably fine. Scientists aren’t sure why we’ve kept these fine hairs, although recent research in the “biology of bloodsucking insects,” may shed some light. Apparently, hair on the body inhibits bloodsucking in two ways: (1) the hairs detect the motion of the crawler, alerting us to its presence and leading (hopefully) to its quick demise; and (2) the hairs are obstacles that prevent the creepers from getting their greedy little mouths attached to our skin. On why some humans have lost their body hair? Why aren’t people more hairy? Why don’t we have hairier faces? Thanks for this article. All evidence (fossil, physiological, nutritional, anatomical, medical etc.) shows that Homo during the Ice Ages did not run over the African plains (sweat = water + salt = scarce in savannas) but simply followed African & Eurasian coasts & rivers, beach-combing, diving & wading bipedally for littoral, shallow aquatic & waterside foods (rich in brain-specific nutrients e.g. DHA). No wonder human ancestors like other medium-sized tropical semi-aquatics lost their fur. Contrary to what you say, the fossil evidence is overwhelming (e.g. archaic Homo had long flat skulls, projecting noses, flattened thigh bones, thick & dense skeletons, broad large lungs, ear exostoses etc., all typical for shallow-diving littoral mammals). The littoral theory is not about apes or (pre)australopithecines more than 5 mill.yrs ago as Alister Hardy & Elaine Morgan thought, but about Pleistocene Homo (less than c 2 mill.yrs ago) whose fossils are invariably found ext to edible shellfish at coasts & inland at river valleys, oxbow lakes etc. For recent insights, google e.g. researchGate marc verhaegen. It’s not an absence of hairs that make the exoparasite hypothesis worthy of further consideration, but the remarkable sensitivity of the hairs we retain. Oops – I missed the Bonus Facts at the end, which addresses some of the content of my previous comment. Unlike the other great apes, our early ancestors moved away from forests as the environment started to get drier 4 million years ago in Africa. We adapted to this environment in two ways. Firstly by walking upright we could spot danger or food at a distance. ( It is thought that our early ancestors may have supplanted their vegetarian diet by scavenging) Secondly by losing hair and by sweating we were able to move around in the heat of the middle of the day. Predators like lions are at their least active at that time, preferring to lie in the shade and hunting at night, by which time our early ancestors was probably safely asleep up a tree. Johan, if our ancestors stood erect on the savanna, every predator could see them from far (monkeys can easily stand upright to look over savanna grasses, and they do this for only a few seconds). If we lost our fur to sweat better, you should note that sweat = water + salt are scarce on savannas, that humans need up to 10 liters of water in hot & dry environments, and that the most-sweating animals are overheated furseals on the beach (Bartholomew & Wilke 1956 J.Mammal.37:327). Running on savannas in the middle of the day is the worst thing you can do: why do you think there are siestas (siesta from Latin sexta hora = noon)? Please inform: our Pleistocene ancestors simply followed the African & Eurasian coasts & rivers when they dispersed intercontinentally, beach-combing, diving & wading bipedally for littoral, shallow-aquatic & waterside food such as shellfish, which can be opened with stone tools, and are richest in brain-specific nutrients (DHA). It’s time the ridiculous savanna story is abandoned, please google: econiche Homo.